The issues of ethnic minorities and their relationships with the Slovak majority population have traditionally been topical and delicate in Slovakia. This was probably one of the reasons thanks to which the team of researchers representing Prešov University in Prešov (the Faculty of Arts, the Faculty of Greek-Catholic Theology), Pavol Jozef Šafárik University in Košice (the Faculty of Arts), Comenius University in Bratislava (the Faculty of Law), and the Institute of Social Sciences of the Slovak Academy of Sciences in Košice have won the support of the Scientific Grant Agency of the Ministry of Education, Science, Research, and Sports of the Slovak Republic. The two-year project meant a chance to prepare both output in the form of a specialist monograph mapping the results of previous research by its authors and the current status of knowledge. The main ambition of the present publication is to provide a synthetic background material on the issue of the status of selected ethnic minorities in Slovakia in the 20th century through specific features of the historical development of Slovakia in the first half of the 20th century based on an interdisciplinary approach (history – politics – law) in the context of both national developments and contexts of international politics. The information herein contained offer basic guidance on the above set of issues and are intended primarily for international readers who want to orient in it or, eventually, take a look at it or its aspects through the eyes of Slovak researchers. The respective chapters and subchapters of this publication have arisen primarily on the basis of the earlier primary research of the authors. In developing the structure of the publication and its text itself, the authors´ primary concern has been transparency, therefore its reference apparatus is reduced to the necessary minimum. Its role is in a sense compensated for by the selective bibliography on the set of issues, which in addition to the cited and exploited sources also contains selected and exploited core sources especially of Slovak origin. 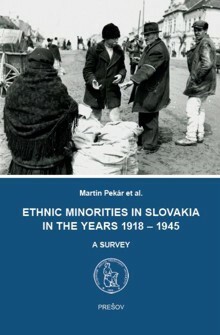 3 Ethnic Minorities in Slovakia and State Policy Towards Minorities Between the Years 1918 and 1945.